More showers expected this evening across PEI. Saturday, October 13th 9:20am.. The system that has plagued the island over the past few days has finally shifted east with some clearing expected this morning. 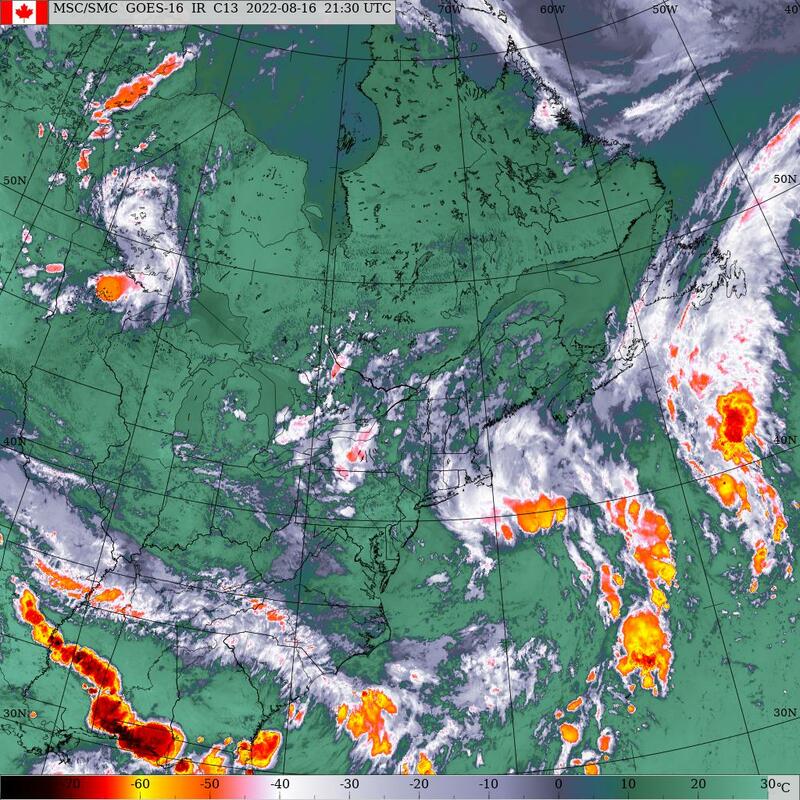 The clearing won’t last long as another weak system is expected to move across the Maritimes later this evening and overnight with some cloud and chance of showers. A large area of high pressure will give lots of sunshine to the island tomorrow as it passes south of NS. Clouds will once again be o the increase on Monday as a strong area of low pressure approaches from Hudson’s Bay. This system is expected to move into the northern Gulf of St Lawrence Tuesday morning as a strong fall storm accompanied by wind and a cold rain. Clearing will begin on Tuesday afternoon as this system pulls away but cold NW winds will prevail. A weak ridge of high pressure may offer up some sunshine on Wednesday morning/afternoon. More cloud and showers Wednesday into Thursday as a cold front sweeps though. Could see the showers change over to flurries by early Thursday morning as the front moves east and the colder air moves in. Weak high pressure looks to give some sunshine on Friday. Precipitation.. Chance of a few showers this evening as that weak system goes through. Dry for tomorrow into early Monday but can’t rule out an afternoon hit/miss shower in the cool unstable air. Rain begins Monday late afternoon/early evening ending near dawn on Tuesday morning giving about 10 mms. Brief dry spell Tuesday afternoon-Wednesday afternoon. Rain begins Wednesday afternoon tapering to showers near midnight. These showers may then change over to flurries by Thursday morning then continue as showers or flurries/snow/ice pellets through the remainder of the day. Dry on Friday. Temperatures.. Basically below normal for this period except for a brief warm-up back to normal Monday afternoon-evening then Friday-Saturday of next week. Normals for this time of year are highs 12, lows 4. Wind.. Light west today increasing to light-brisk NW tomorrow then shifting to SW Monday afternoon. Winds then shift back to brisk-strong westerly on Tuesday. Light-brisk SW winds on Wednesday becoming NW on Thursday. Hazards.. Wet driving conditions in showers this evening and Monday night. Could be quite windy Tuesday afternoon which may cause some bridge restrictions.